Debt ceiling crisis coming in October. 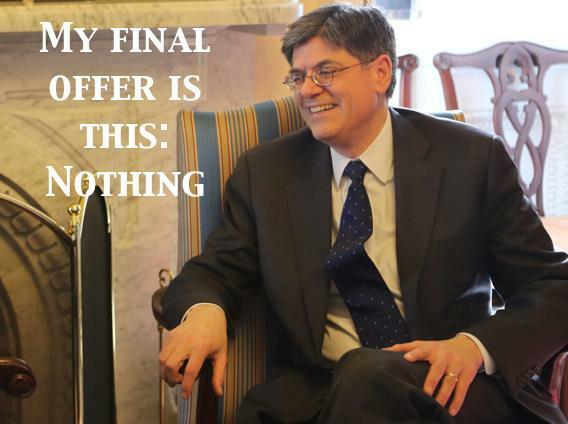 Photo illustration by Matthew Yglesias, photo courtesy of Sen. Mark Begich’s Twitter feed. Late Monday, the Treasury Department announced that the federal government will hit the statutory debt ceiling in the middle of October, setting the rough date for the next political/economic crisis. Republicans have been offering a lot of wild theories about their negotiating strategy around this, but on CNBC this morning Secretary Jack Lew said the right thing about the administration’s bargaining strategy—there is no strategy because there is no bargain. Getting sucked into a negotiation over raising the debt ceiling back in 2011 is one of the biggest mistakes the Obama administration ever made. It’s one they avoided repeating the second time around and should never try to repeat again. The basic problems with negotiating over the debt ceiling are twofold. One is that the consequences of refusing to allow the executive branch to pay bills that Congress has already authorized the executive branch to pay are absurd. People sometimes phrase this in terms of a financial crisis, which I think is in some ways overblown. The issue is a political and legal crisis. You have the Social Security Act on the books. You have appropriations bills on the books. It’s illegal to not pay Social Security recipients what they’re owed. It’s illegal to not pay federal marshals what they’re owed. It’s illegal to not pay defense contractors what they’re owed. And it’s illegal to seize extra tax money. If Congress doesn’t raise the debt ceiling it also becomes illegal to borrow to fill the gap between legally authorized tax revenues and legally required spending. That’s nuts. The second problem with negotiating over the debt ceiling is that it’s not a real disagreement. A bargain would be something like Obama wants to pay for universal preschool by raising taxes, so Republicans say “we’ll fund your preschool idea if you pay for it by cutting spending on other programs instead.” That’s a trade of priorities. But raising the debt ceiling isn’t an Obama administration priority, it’s something Republicans also know is necessary. Giving Republicans something in exchange for it is like giving them something in exchange for agreeing to not bomb the Capitol building. Back in 2011, in an act of hubris and weakness, the administration decided that debt ceiling negotiations might be a good backdoor way to entrap both mainstream conservative Republicans and liberal Democrats into a “grand bargain” on long-term fiscal policy. We got no bargain, just a panic. It can’t happen again. My favorite solution would be to exploit the platinum coin loophole and put this issue behind us forever. But a smarter political strategy is probably the one Lew outlined on TV. No negotiations. No tricks. Congress just needs to step up.